The town of Elkins was originally known as Scytheville, named for the multitude of water-powered scythe factories that dotted the river flowing out of Pleasant lake. (A scythe is a long curved knife, typically attached to a wooden handle, and used for manually cutting hay. It's the thing that the Grim Reaper carries around). The scythes created here were actually world-renowned for their quality... an improbable sounding achievement for a small town way out in the New Hampshire woods! The original house - really a mansion, even by today's standards - that stood on this site (pictured below) was built in 1882 by the owner of the scythe mills. Situated on a small hill that overlooked the entire factory area, it had a commanding presence over the entire town. 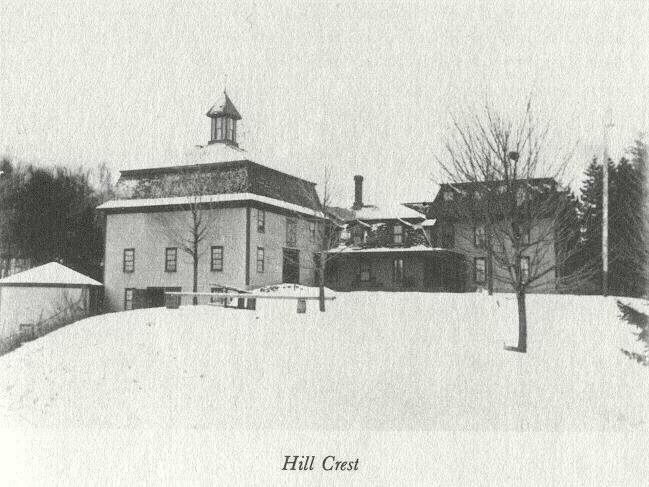 He named it Hill Crest for the location that it occupies; the road to our house reflects this original, long-gone occupant. Over time, as mechanical harvesting technology developed, the demand for scythes waned, and the scythe mills eventually closed. Scytheville, now renamed Elkins for a principal resident, evolved from a bustling factory town to a sleepy, sparsely populated residential town. The house was sold around 1900 and converted to an inn, and eventually burned to the ground in the early 1920's (a common fate of wooden buildings lit by open flame). The property then sat untouched for 80 years, the wilderness slowly reclaiming the land and densely recovering it with trees. The view pictured below is looking westward, toward Pleasant lake - generally what you'd see as you drove up our current driveway. The leafless tree in the foreground generally marks the far edge of our current leach field; the entire area between it and the camera is now densely wooded with large trees. Our garage doors would be on the far side of the lower center (darker) part of the building. 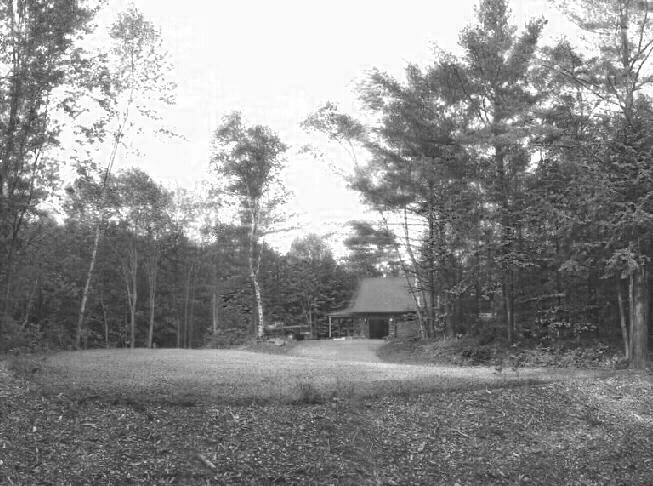 The sunken lawn in the "old foundation" is where the right-hand portion of the building stood; the lower end of the "golf course" lawn occupies the area under the large, cupolaed barn at left. Given that much of the structure was 3 stories, this was indeed a very large building!